Beginning with his hometown of San Francisco and traveling to cities such as Paris, Rome, Buenos Aires, and Tokyo, Paul Madonna delivers his second body of drawings and writings. This stunning new collection, a testament to an artist and storyteller's careful observation of both the external and internal worlds, outdoes the masterful performance of his first book All Over Coffee, offering an even richer catalog of pen and ink cityscapes, short stories, conversations, and thoughts. Entertaining and moving, gorgeous to look at, Madonna's work remains unique and unclassifiable. This full color, hardbound edition comes complete with a removable poster. Paul Madonna produces two weekly strips, ALL OVER COFFEE in the San Francisco Chronicle and on SFGate.com, and SMALL POTATOES on TheRumpus.net, where he is also comics editor. Paul regularly travels internationally to draw and his work is shown in museums, galleries, restaurants and cafes, and is published in various book collections and publications, including his international newspaper coverage of the U.S. 2009 Presidential Inauguration. In 2007 the first collection of ALL OVER COFFEE was published by City Lights Books, and the second collection is scheduled for release March 2011. In 1994 Paul received a BFA from Carnegie Mellon University, and that same year he was the first (ever!) Art Intern at MAD Magazine, for which he proudly received no money. Paul currently lives with his wife in San Francisco. His website is paulmadonna.com. "In this exquisite second collection from his long-running weekly San Francisco Chronicle series All Over Coffee, Madonna captures snapshots in time as he explores the relationship between image and text, with a mixture of single- and multi-panel strips all presented vertically. Completely devoid of people but never of life, each panel revolves around a geographical setting, from recognizable landmarks like the Golden Gate Bridge to an anonymous block that's so gorgeously rendered in Madonna's precise yet fluid pen-and-ink style, it feels like it could be anywhere and everywhere. The integration of textfrom snippets of fiction and autobiography to single sentences stretching across panelsis as deliberate as the pen strokes and ink washes, and as essential to grasping the complete picture. Though there are no conventional narrative arcs, Madonna continually revisits such themes as place and memory as he deconstructs the traditional storytelling elements in this 'comic strip without the comic, whose main and only character [is] setting.' With pieces depicting San Francisco, New York, Barcelona, and Tokyo, Madonna's work is something to savor, because, as the artist writes, you 'want to absorb every moment of this, enjoy every second.'" "The book is fantastic. Of time and tenderness. Beautiful drawings. Beautiful text. Ethereal and serious at once. The book is its own reward." "In Everything is its Own Reward, Paul Madonna has not only pressed graphic fiction way beyond its present boundaries, he has created a new and stunning art form where the stand-alone brilliant visuals and the hauntingly human words synthesize into a pure and irreducible aesthetic vision. This book taught me something fundamental and true and beautiful about the ineffable thereness and thingness of life. Everything is its Own Reward is a work of genius." "You don't have to have lived in or loved San Francisco to fall under the spell of Madonna's mysterious and largely unpeopled cityscapes. San Francisco isn't the only place he draws with the miraculously exquisite attention on display here (Paris, Rome and Buenos Ares also appear) but something about the fog off the bay makes it particularly well suited to his dreamy and surprisingly emotional pen-and-ink images. Madonna eschews well-known and much-photographed places in favor of the spaces between old Victorians, neglected corners, intersections that seem to cant dangerously into space, vistas of rooftops bristling with pipes and ganglia-like clusters of power lines, all paired with short enigmatic stories and reflections on art, memory and love. This book is the second collection of 'All Over Coffee,' a 'strip' Madonna draws for the Sunday arts section of the San Francisco Chronicle. There's also a free app, too, if you'd like to see a sample, but only paper can do justice to the eerie radiance of Madonna's artwork, and the cumulative effect of its 176 pages is ravishing." "Paul Madonna is a pen master. His work is difficult to categorize but that he was MAD magazine's first art intern may help explain his ability to capture human experience in its odd fullness. 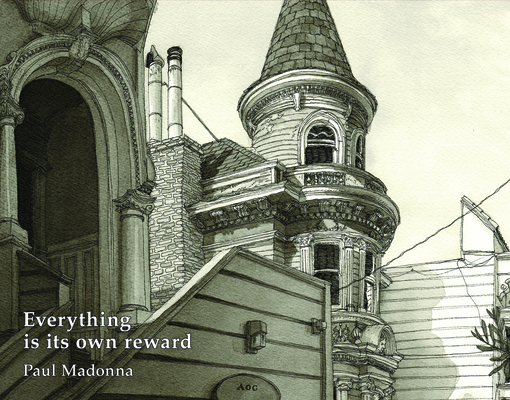 In his All Over Coffee comic strip, published in the San Francisco Chronicle since 2004, Madonna's evocative pen-and-ink drawings of cityscapes are accompanied by handwritten bits of overheard conversations, mini-stories, and zen-ish musings like: 'It takes perpetual work to keep life simple.' The new anthology Everything Is Its Own Reward: An All Over Coffee Collection (City Lights) is a treasure chest that comes with a pullout poster inside." "One flip of the page and you’ll be hooked on his melancholy world of beauty, stillness, and reflection." "In addition to the many lovely images and a briefly annotating afterword, the book also has a poster folded up inside its back cover, wherein he gazes at some brutalist-anonymous apartment building on Russian Hill, maybe? and suggests vital details of the lives going on inside it: 'Lies about owning a TV' or 'Starts every sentence with "I feel like"' or 'Lobbies government agencies and airlines to provide family and nonfamily flights so that people without children can fly without having to listen to screaming kids.' Hey, look: It's us." "It's not the spirit of any particular place that Madonna captures so well but rather a quality of life, a state of mind, predicated on the luxury of having an existence in which the only dramas to speak of are personal." "Madonna gets an extra chills-up-the-spine boost from his illustrations of semi-familiar San Francisco architecture and intersections, lucid as etchings of bleached Kodachrome shots."